The cherry blossoms for most spots around Kyoto in 2019 will be blooming around late March to early April. 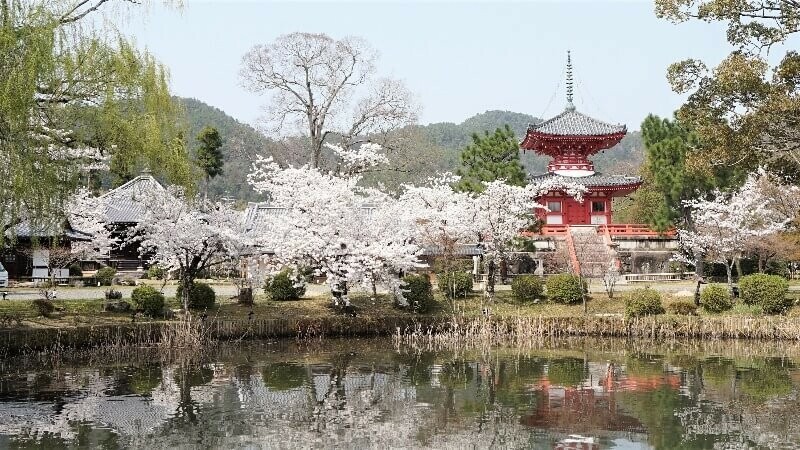 In this article, we’ve broken Kyoto up into 6 areas, “Rakuhoku”, “Rakunan”, “Rakusei”, “Rakuto”, “Rakuchū” and “Rakugai”. We will also be putting information on the viewing period, directions, entrance fees and special characteristics of each spot down below. 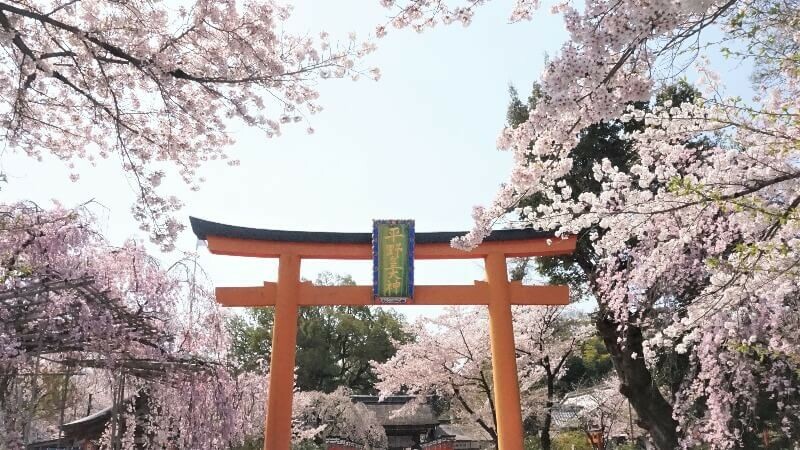 Taking the overall theme having a relaxed time, in order of top to bottom, we’re will introduce some great cherry blossom spots that you relax and enjoy, including the famous Maruyama Park and Nijo Castle. The area of Kita-Ku and Sakyo-Ku. Home to the world heritage sites of Kamigamo Shrine and Shimogamo Shrine, as well as Kifune Shrine and Kurama-Dera Temple. The tunnel-like Double Weeping Cherry blossoms. 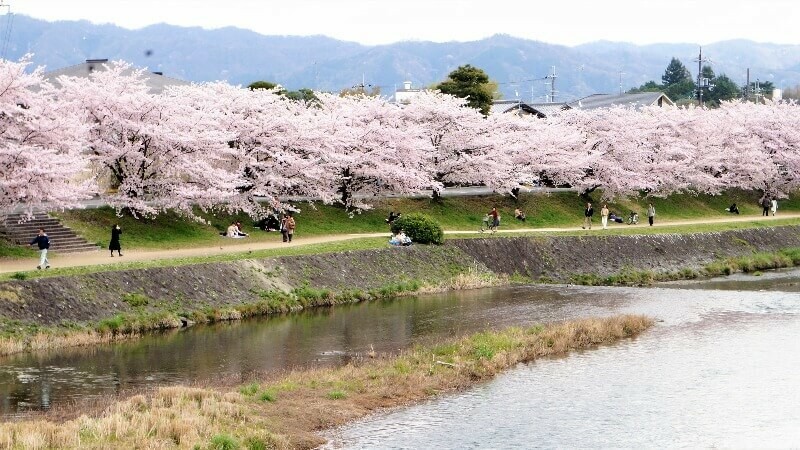 The Nakaragi Path is a famous Sakura cherry blossom spot along the Kamogawa River. Time slows down on this 800-meter path as you sit back, relax and watch the river surrounded by cherry blossom trees on both sides. 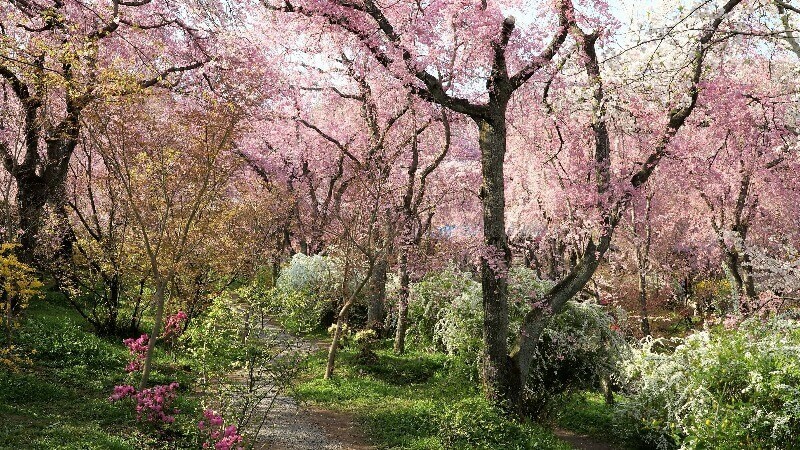 Breathtaking scenery of over 200 weeping cherry blossoms. 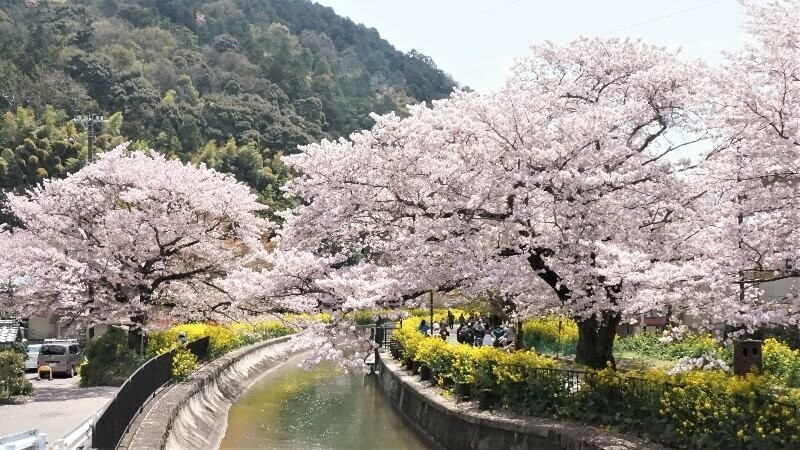 Although the Haradanien Garden is slightly outside of the city and a little inconvenient to get to, you can enjoy the fantastic scenery of cherry blossoms blooming in nature. We highly recommend this spot! Please note that food and drinks are not allowed inside the garden. A unique spot where you can see a vast array of different types of cherry blossoms in a wide open space! 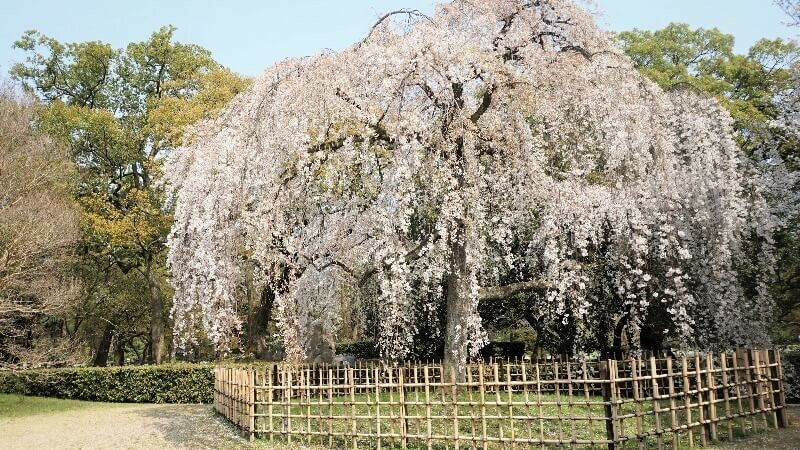 There’s a beautiful and solemn air to this space—which has mixed the world heritage site of Shimokami Shrine with a wide array of cherry blossoms, including Gosho Zakura and the famous Plena Rosea Saiō-zakura tree. The area of, and south of, Kyoto's Kamigyo-Ku. Home to famous sightseeing spots such as Nijo Castle and Kyoto Gyoen. The area surrounding the former residence of the Emperor and containing 1,100 cherry blossoms. With this site having a total radius of 4 km, it never gets crowded, even when there are a lot of people. 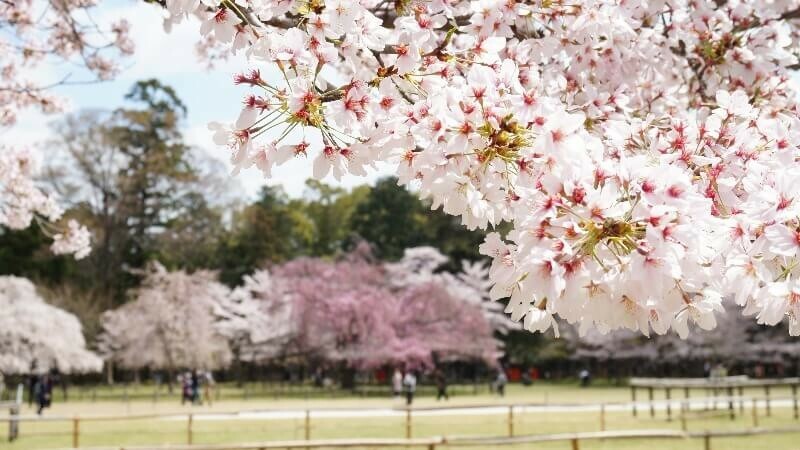 The Kyoto Gyoen is the perfect place to throw down a picnic blanket and enjoy some cherry blossom viewing at a Hanami picnic. 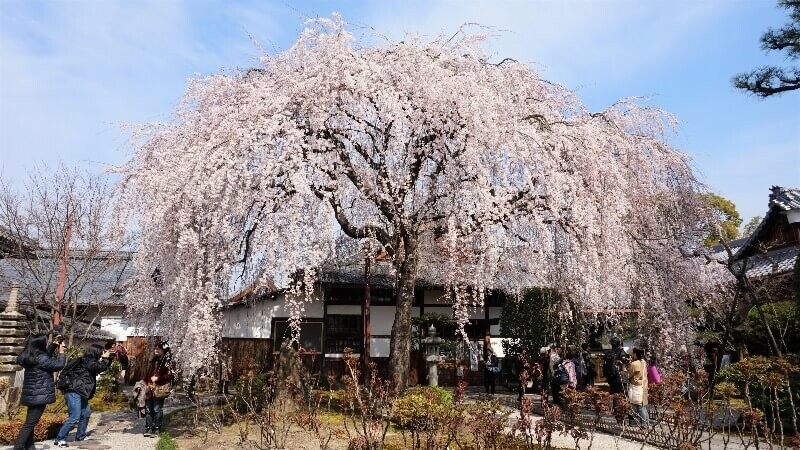 90-year-old sister tree to Maruyama Park’s famous “Gion Weeping Cherry Blossom”! There aren’t a huge amount of cherry blossoms here; however, everyone should take the opportunity—at least once—to check out Kyoto’s biggest weeping cherry blossom! One of Kyoto’s top cherry blossom spots with over 60 different kinds! As there’s an array of cherry blossoms here—with early bloomers starting in mid-March and late bloomers around April—it means that you can enjoy a full month of beautiful cherry blossoms. Hirano Shrine also holds a light-up event from March 25th to April 20th (18:00 to 21:00), so we definitely recommend checking it out. 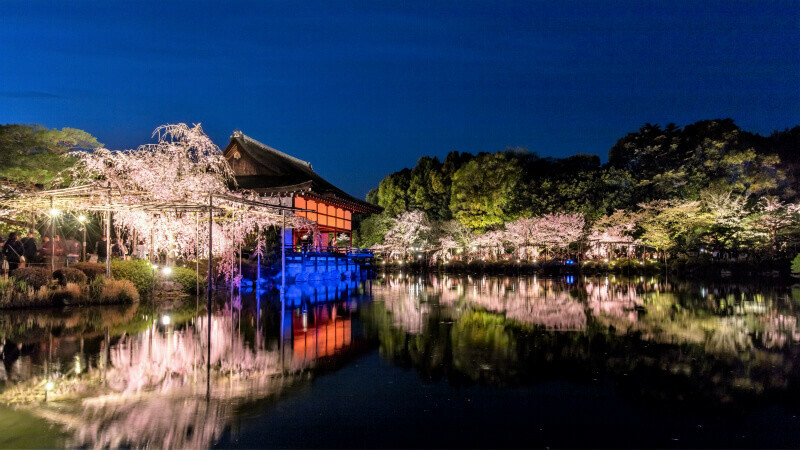 Enjoy a fantastic light-up event that includes rare cherry blossoms at the world heritage site Nijo Castle! East of Kamogawa River. Home to major sightseeing spots such as Tōfuku-ji Temple in the south and Kinkaku-ji Temple in the north. 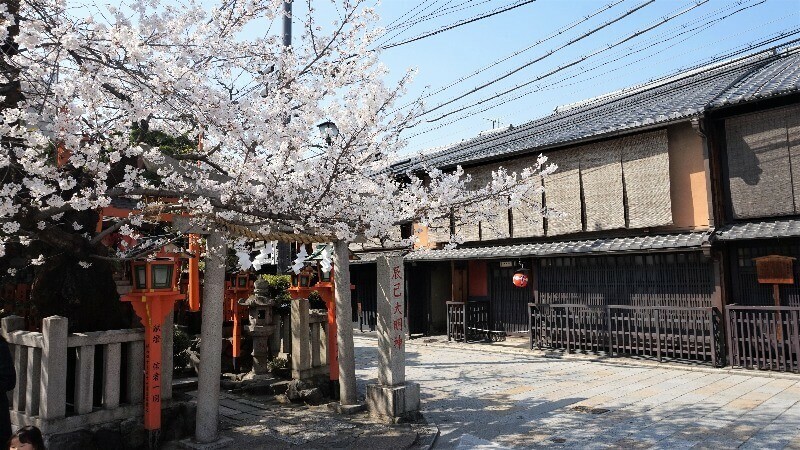 Enjoy the cherry blossoms as you stroll through this traditional Kyoto-esque area. The blooming cherry blossoms sit beautifully among the Kyoto-esque streets characteristic of the Gion district. A lot of people come through this area and its got such a nice atmosphere that it’s often used in the filming of TV dramas, so why not come and see what it’s all about for yourself? Enjoy the magnificent scenery of riverside cherry blossoms at this canal reminiscent of historical Kyoto. The Okazaki Canal (Lake Biwa Canal) was made in the Meiji period to channel water from Lake Biwa to Kyoto. Why not enjoy a stroll along the canal and bask in the beautifully cherry blossoms? From March 23rd to March 27th we definitely recommend enjoying the cherry blossoms from a Jikkokubune canal boat, which run from 9:00 to 20:30 (Reservations required). The Kyoto cherry blossoms that can be seen from Nanzen-ji Temple’s San-mon gate are absolutely spectacular! 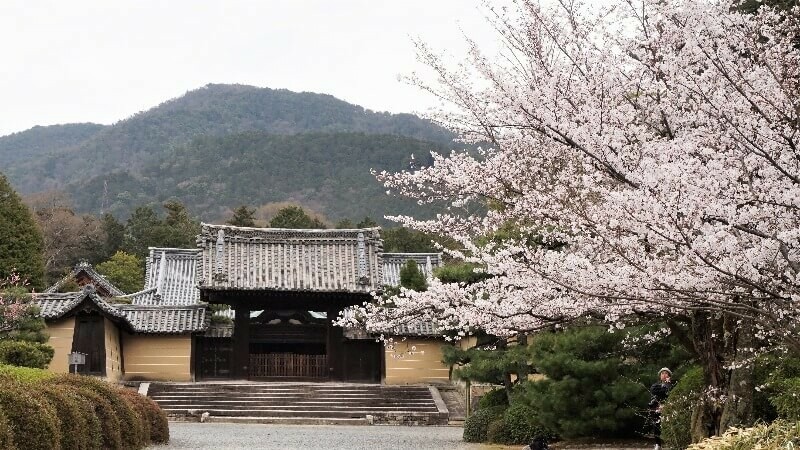 The sprawling temple compound of the Nanzen-ji Temple has a number of fantastic spots for cherry blossom viewing, so it’s perfect for a Hanami cherry blossom viewing picnic. 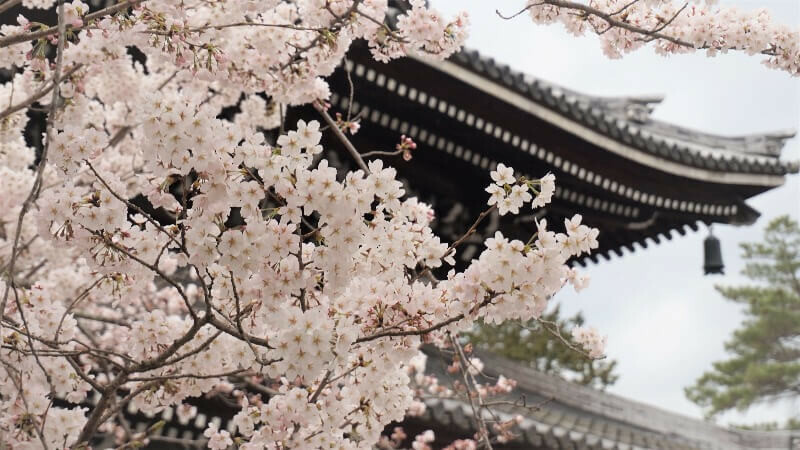 On top of that, you can go up and see the cherry blossoms from the balcony of the San-mon Gate, so we definitely recommend checking out this temple for a rare cherry blossom viewing opportunity. A Sengoku warring states period-esque landscape of magnificent cherry blossoms. This spot is surprisingly not so well known, even though the Somei-Yoshino cherry blossoms outside the Sanmon gate are astounding. A great spot to just relax and enjoy your time. 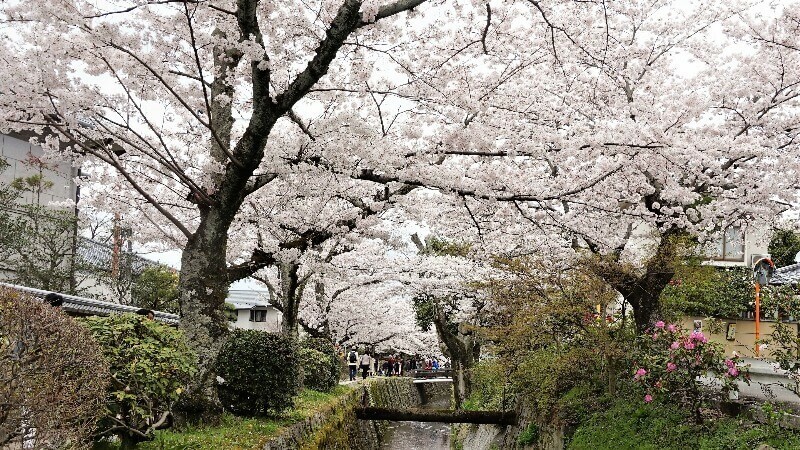 This 4km long canal—boasting an impressive 660 cherry blossom—is an absolute must see! This section of the Lake Biwa Canal is the only place in Kyoto where you can enjoy both the beautiful pink of cherry blossoms with the yellow of rapeseed blossoms. We recommend bringing something light to eat and having a picnic. This giant 150-year-old cherry blossom fills the sky with its petals. This temple is a little far from the station and requires climbing up some steps, which may be a bit hard for some, but you can take that time to enjoy a leisurely stroll. Also, getting a glimpse of this magnificent cherry blossom will make you forget how hard it was walking up all those steps. Enjoy the modest beauty of this Sakura cherry blossom at the Temple of star-crossed lovers, Toyotomi Hideyoshi and wife Nene! The beautiful weeping cherry in the Hojoteien garden has a relaxing and stoic ambiance to it. When the tree’s litten up at night, you can feel an almost occult elegance from it. Kodai-ji holds a light up event from March 8th to May 6th (18:00 to 21:30), which we highly recommend. Enjoy the over 1,000 Sakura cherry blossoms at the most classic of all Kyoto sightseeing spots! The Butai main stage and three-storied pagoda—which are surrounded by over 1,000 cherry blossom trees—are almost otherworldly. The main hall is currently under construction, so this may affect the light up event; however, you can still get a wonderful, all-encompassing view of Kyoto. 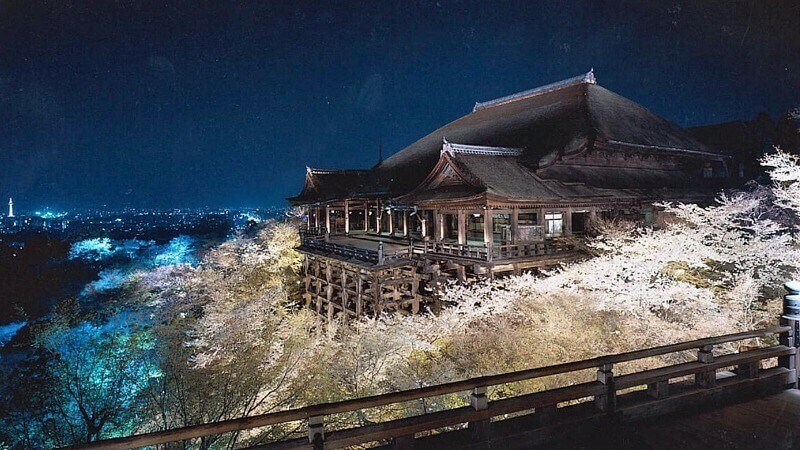 Kiyomizu-dera holds a light up event which runs from March 29th to April 7th (18:00 to 21:00) and is highly recommended. 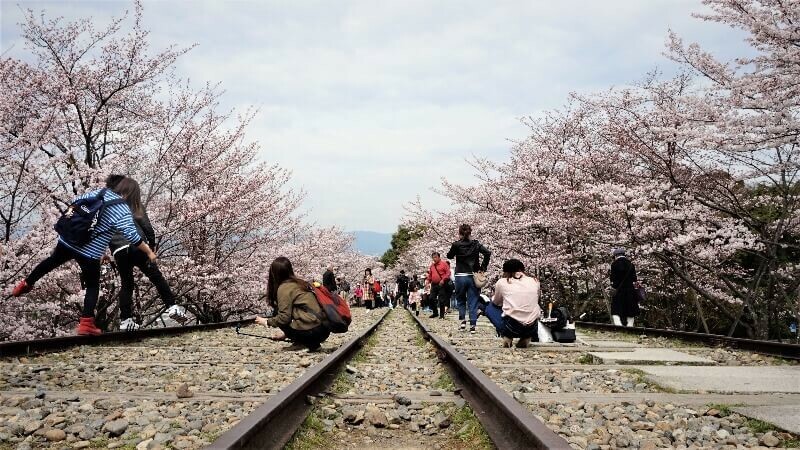 Take a stroll down the cherry blossom lined train tracks. Enjoy the unique, lovely atmosphere of these cherry blossom lined train tracks, which become engrossed in the pink petals of the blossoms as they bloom and blossom, filling the sky. Leaving aside the crowds, this is a must see cherry blossom spot in Kyoto. Take a stroll down the romantic riverside cherry blossom tunnel. At peak season, the ground and water alike are covered with small cherry blossom petals, and the path becomes like a cherry blossom tunnel! Along the path—which stretches from Nanzen-ji to the silver pavilion of Ginkaku-ji—there are stores selling knick-knacks and the famous Yojiya Café, so this is an excellent spot for taking a little wander down some back streets as make your way down the path. Enjoy the fantasm of the bright lights and cherry blossoms reflecting off the water! 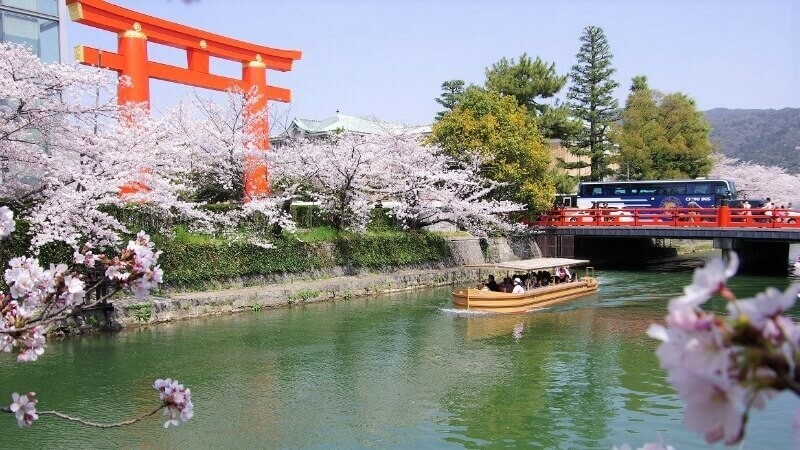 Heian Jingu's biggest appeal has to be the fact that you can enjoy the brilliant colors of the bright red shrine together with the beautiful cherry blossoms that reflect off the water, all on a spring’s night. 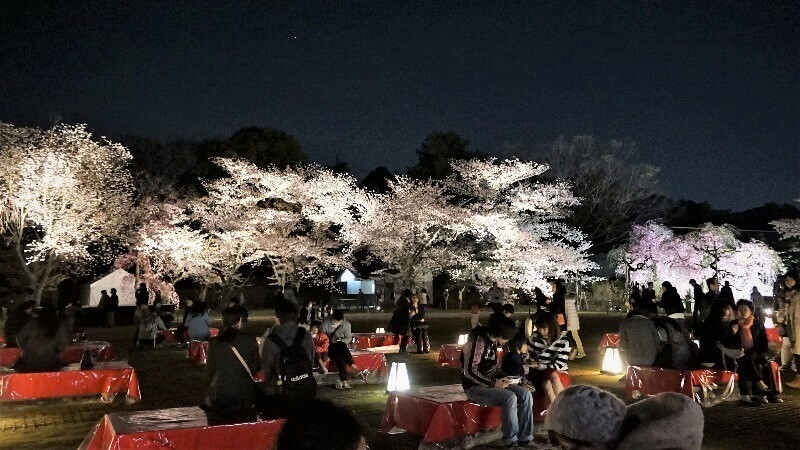 Heian Jingu might also be the only place where you can enjoy a light up event, while enjoying a cherry blossom viewing picnic at night. The light up event runs from April 4th to 7th (18:15 to 21:00), so definitely check it out if you can. Soak up the springtime in this nature rich spot! 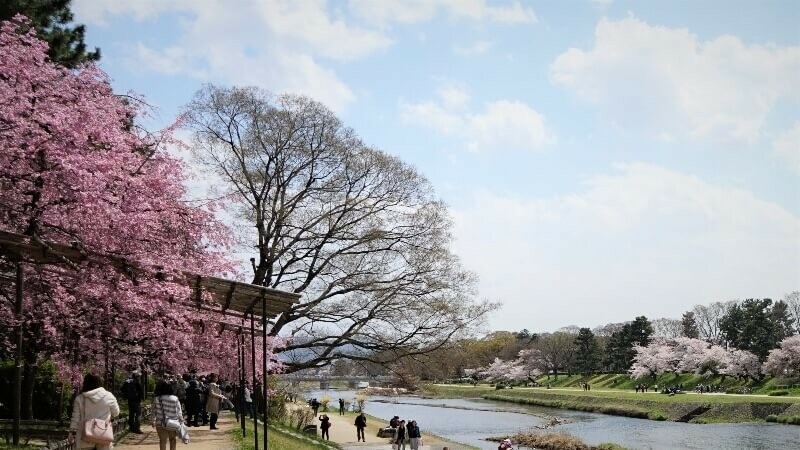 At Kamogawa River you can sit back, relax and enjoy some food under the riverside cherry blossoms. The area from Sanjo to Shijo is always packed, so we recommend going north to the Imadegawa area. There you will be able to enjoy the quiet spring air. The area of Ukyō-ku, Nishikyō-ku and Nagaokakyo. Home to the world heritage and sightseeing spots of Kinkaku-ji, ryoan-ji and Ninna-ji. The delightful weeping cherry blossom and gently falling petals are a must see! 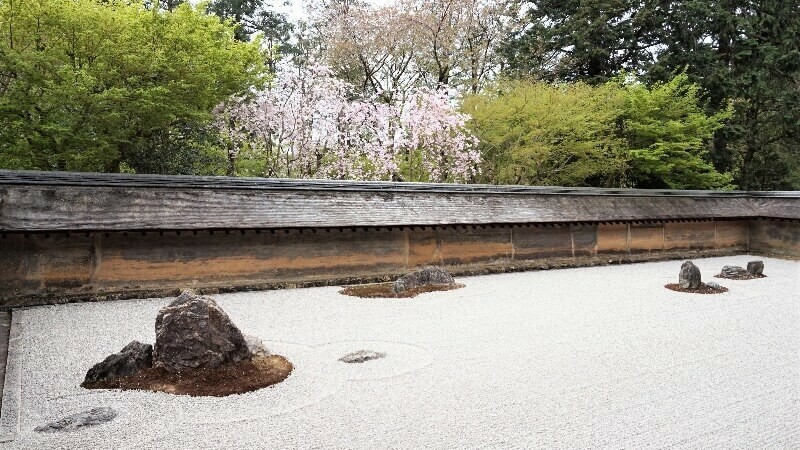 At Taizō-in you can enjoy a Karesansui Japanese rock garden under the blossom of an over 50-year-old cherry blossom. Inside the temple compound you can enjoy Matcha green tea, Japanese sweets, and even Buddhist vegetarian meals! You can also enjoy the cherry blossom and garden at night too. The sparkle of the lake and color of the cherry blossoms weave together, creating a superbly Kyoto-esque landscape. 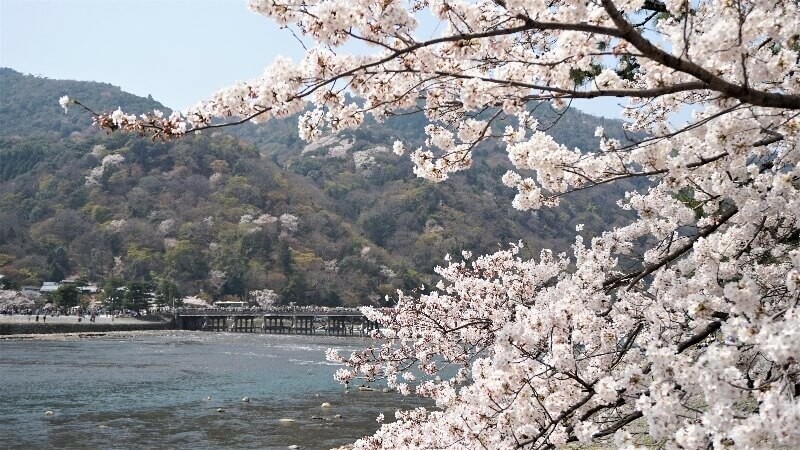 At Daikaku-ji you can enjoy the beautiful scenery of the 1km of cherry blossoms—which line Japan’s oldest manmade lake “Osawa-no-ike”—as they bloom and blossom all at once. The cherry blossoms are also incredibly captivating as they reflect off the water. Enjoy the view of a quaint cherry blossom over hanging a Zen Buddhisim Karesansui Japanese rock garden! Ryoan-ji brings together the vibrant colors of a weeping cherry blossom and a traditional Japanese rock garden. The view of the cherry blossom petals gently falling and tumbling into the rock garden brings a unique and subtle aesthetic to the garden. 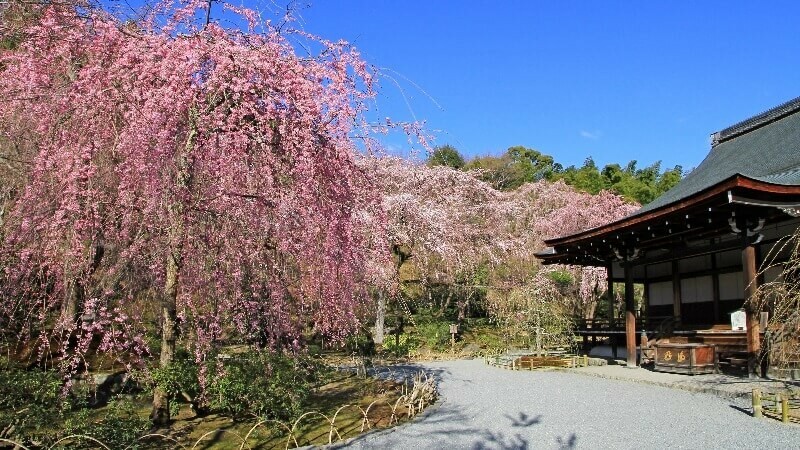 Ryoan-ji is home to an array of cherry blossoms, including Somei-Yoshino Cherry, Prunus jamasakura, Red Prunus Itosakura (Weeping Cherry) and Yaezakura (Double flowered cherry blossom), so you will definitely leave satisfied. 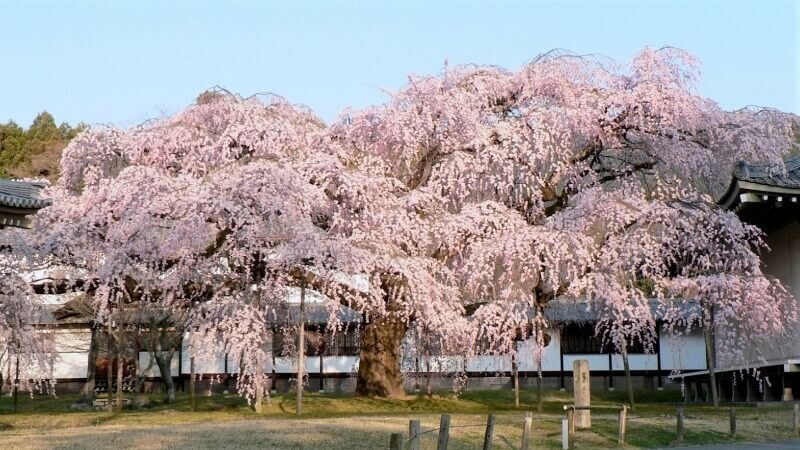 Enjoy beautiful cherry blossoms at this designated world heritage site rich in history. The cherry blossoms are absolutely captivating as they hang their petal covered branches over the front of the temple. Although Tenryū-ji is often very crowded, the fantastic, nature rich scenery is a must see! Enjoy the beautiful scenery of this traditional wooden bridge against the backdrop of sprawling river side cherry blossoms! Along the river near the Togetsu-kyō bridge stretches the beautiful, snowy scenery of 1,500 cherry blossoms. This area is also home to a lot of bustling stores, so you can do some shopping while taking in the cherry blossoms. The cherry blossoms at Ninna-ji are characterized by their uniquely short trunks. A favourite at this temple is snapping a picture of the five stories pagoda sitting among the cherry blossoms. Although Ninna-ji is a little far and inconvenient to get to, the temple compound is huge so it never feels crowded, even when there are a lot of people around. Ninna-ji’s cherry blossoms are comparatively late bloomers, so you’ll be able to enjoy them until around mid-April. The area of southern Higashiyama-Ku and Fushimi-Ku. Home to famous sightseeing spots such as Daigo-ji. The contrast of the cherry blossoms and Tōrō lamps are a must see! A little known cherry blossom spot walkable from Kyoto Station. The shrine compound may be a little small, but the beautiful cherry blossoms, Tōrō (Traditional Japanese lamps) and Taiko-bashi (Arched Bridge) are all balanced well with one another. 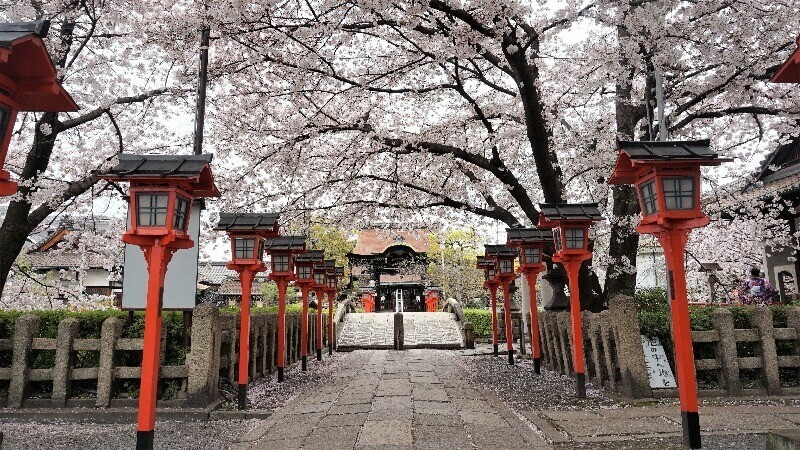 With the large number of beautiful Somei-Yoshino cherry blossoms—the main blossom at this shrine—Rokusonnō Shrine has become a popular place for wedding photos and Geisha photo shoots. Rokusonnō Shrine is in walking distance of Kyoto station, so we highly recommend it. 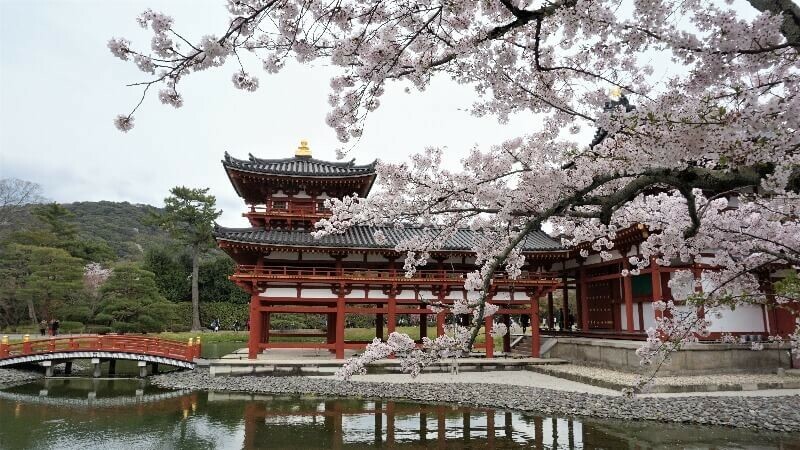 Enjoy over 1,000 cherry blossom trees in this massive 6,600,000 square meter temple compound. 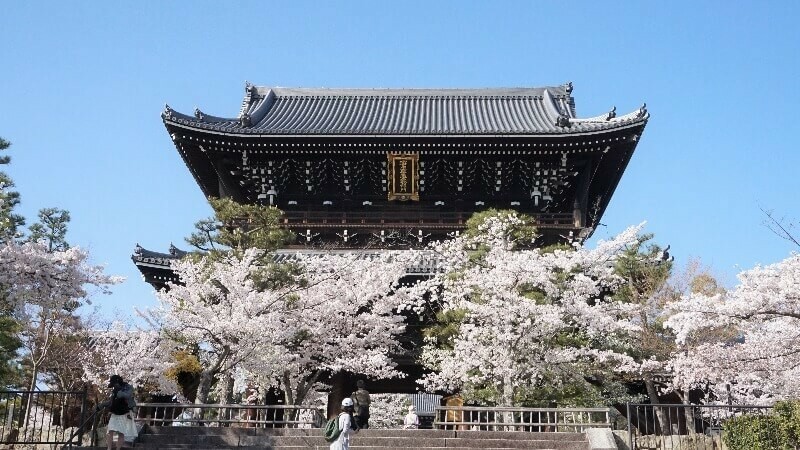 This temple is famous for Toyotomi Hideyoshi’s so-called “Daitoku-ji Hanami” cherry blossom viewing. 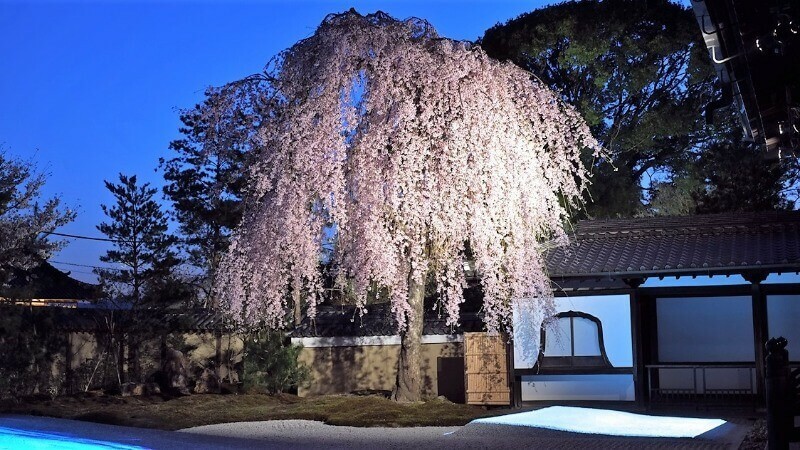 At Daitoku-ji there are an array of cherry blossoms that can be enjoyed, including weeping cherry blossoms, Somei-Yoshino cherry blossoms and Jamasakura. 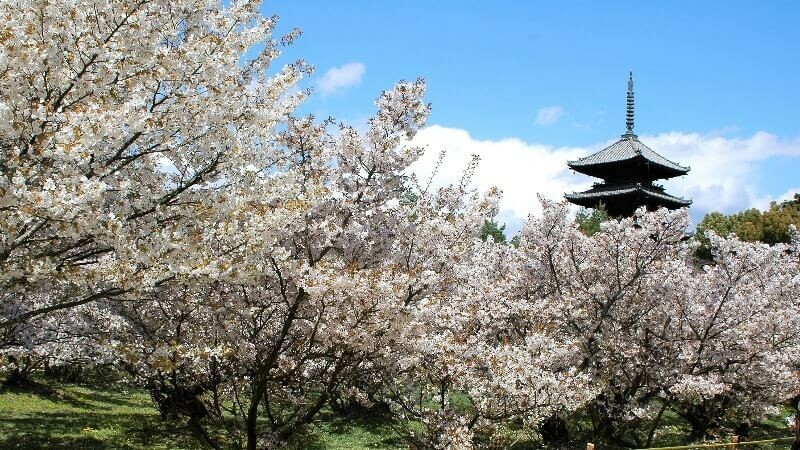 A characteristic of this temple is the 3-week time span where in you can enjoy a Hanami picnic, before all the cherry blossoms’ petals begin to fall away. Among the over 1,000 trees, the most famous is the weeping cherry. All these trees can be enjoyed among the Sanbon-in, Reihōkan and Garan (The seven halls composing the ideal Buddhist temple compound). As the temple compound is incredibly large, it felt less crowded than I expected. 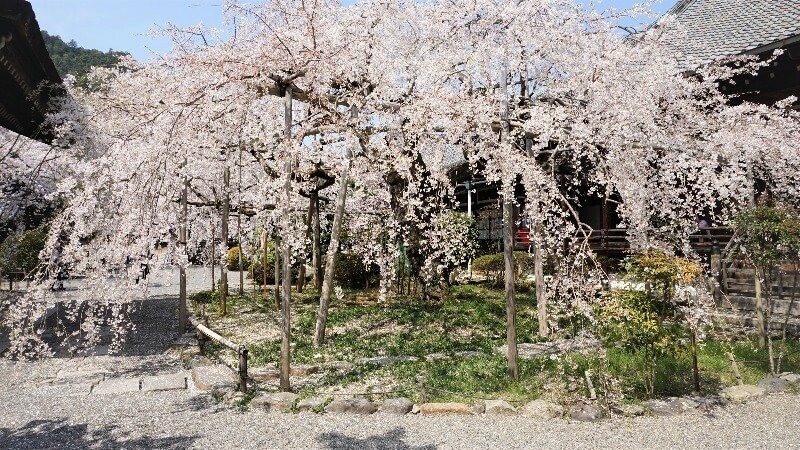 The cherry blossoms of Kajū-ji, popular with the locals, are surrounded by an air of tranquility. Another little known cherry blossom viewing spot in the compound of Kajū-ji temple, which houses a sprawl of beautiful cherry blossoms around the Himuro pond. The Somei-Yoshino and weeping cherry blossoms—which bloom along the white walls of the entrance path—welcome people to the temple with their gorgeous colors. You can also enjoy a short stroll through the tranquil temple grounds. 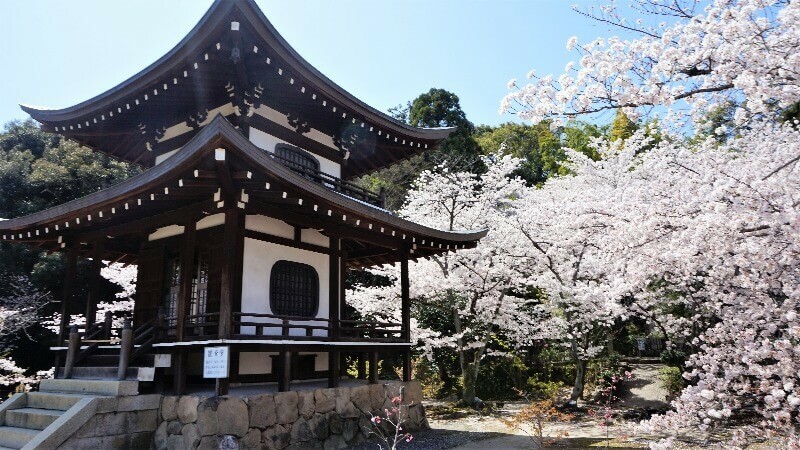 Enjoy elegant cherry blossoms at this temple related to the famous Japanese poet, Ono no Komachi. The towering, old cherry blossom at Zuishin-in is a must see! Zuishin-in is also known for plum blossoms, so you can enjoy both them and the cherry blossoms at the same time. Zuishin-in isn’t a major spot for cherry blossom viewing, so we highly recommend it to anyone who is looking to take some photos or quietly enjoy the cherry blossoms! A classic cherry blossom spot! The double weeping cherry called “Fujiro” is a must see! 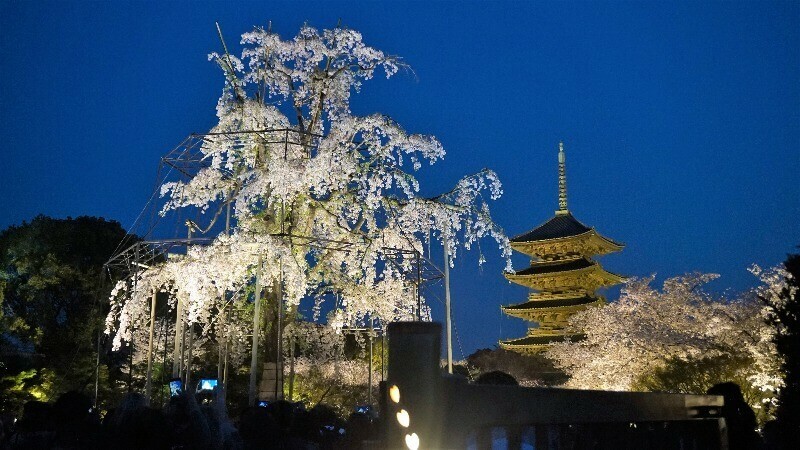 A highlight of this temple is the combination of the towering weeping cherry blossom and the five storied pagoda. Especially during the light up event, the beauty of the compound is further accentuated in the fantastical atmosphere. The light up event runs from March 16th to April 14th (18:30 to 21:30), so definitely check it out if you can. Area outside of Kyoto City. Home to sightseeing spots such as Uji City’s Byodo-in. The combination of the few cherry blossoms—reflecting in the water—and the Hoo-do hall is a must see! You will be blown away by the beautiful contrast between the bright Hoo-do hall and the Somei-Yoshino and weeping cherry blossoms which surround the pond. The light up event runs from April 5th to 9th (18:00 to 21:00), so definitely taking the time to check it out for yourself. Kyoto’s peak cherry blossom season for 2019 is expected to be late March. The peak is usually thought to be around early April. 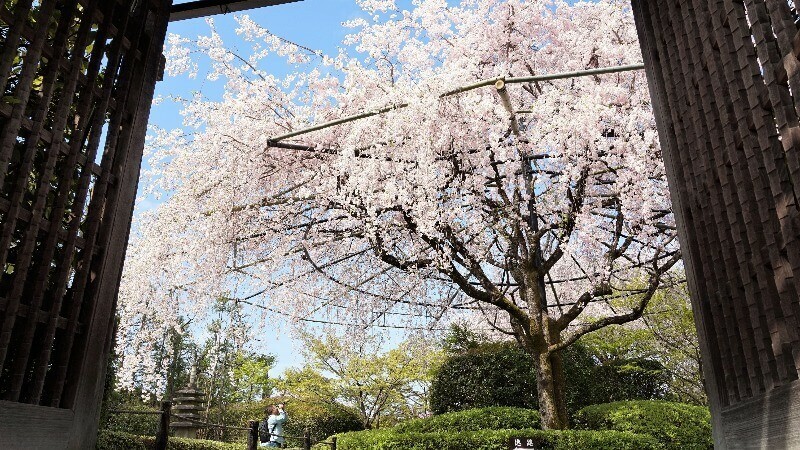 Here we’ve introduced not only Kyoto’s favorite cherry blossom spots, but also a few, little far but few people, hole-in-the-wall type spots as well, so in 2019, why not grab a camera and a bite to eat and have yourself a picnic under the cherry blossoms!